I hope everyone had a happy and safe Thanksgiving. Unfortunately we are once again looking at far less than perfect weather as I prepare this column. The entire N.C. coast is under a minimum of Small Craft Advisory until sometime Saturday and a Gale Watch is posted for north of Cape Lookout through Saturday morning. This probably isn't the best time to be fishing, even though the fishing has been good--surprisingly good actually, considering the weather conditions. I hate to suggest a "honey-do" time over a holiday weekend, but that might be a good thing to do this weekend. You could also consider cleaning the shop or garage, or even doing some maintenance on the trout and fat Albert outfits so you can enjoy them another time or two before Christmas. In spite of the uncertainty of the weather at the end of last week and over the weekend, there were a few windows to get in a fishing trip and then things to talk about on the return. That is one of the many things we should be thankful for at this Thanksgiving. I have mixed emotions regarding weather men. On one hand it is so easy to condemn them for their inaccuracy, but they have a difficult task and especially so in our area. This is where the Jet Stream likes to dip occasionally, but it is often held back by the onshore flow of warmer air from the Gulf Stream. Weather systems advance across the country and are fairly predictable in the interior, but when they get to the coast another set of variables from the water enters the picture. The entire N.C. coast is difficult to predict, but places like Cape Lookout and Cape Hatteras are dang near impossible. Water warms, cools and affects the wind and moving fronts differently than land. This is why we are cooler in the summer and warmer in the winter than our neighbors just a short distance inland. When folks ask me about the weather, one of my favorite examples of the difference at the coast is the summer thunderstorms. So many times they advance in the afternoon to a few miles inland, but the breeze off the ocean holds them back. How many times do we have strong thunderstorms within a few miles of the beach, but we get minimal or no rain along the beach? While my first thought is to say I would like a job where a 50 per cent rate of being correct is acceptable, when thinking deeply, I realize I have one. Like all fishermen, I use everything I know to predict when and where the fish will be biting, but am not always right--not nearly always right. We usually manage to catch a few fish, but it's not always exactly the haul we were expecting. Those weathermen are usually basically right. Oh sure, it still bothers me when they miss the wind by 10-15 knots or call for rain or shine and we get the other, but you know what? It's a lot like fishing--you do the best you can and deal with the decisions you make! This is a time of year to keep a sharp eye on water temperature and we are still running warmer than usual. The water temperature at Bogue Inlet Pier has only cooled a single degree this week and we can't say it was because of warm sunny days this time. I don't understand it, but the water temperature in the surf only dropped from 65 to 64 degrees. The inshore water temperatures vary from three to eight degrees cooler, depending on the distance from the inlet and the amount of rainwater runoff in that area. Capt. Dave Dietzler reported them as low 60s in the Morehead City area earlier this week. The inshore fishing is still going well. Capt. Dietzler (www.capelookoutcharters.com) said he was catching speckled trout, a few flounder red drum and black drum in the marshes and creeks. He said there was also an excellent puppy drum bite in the surf along Shackleford Banks and gray trout, bluefish and false albacore were biting in Beaufort Inlet and down Shackleford banks towards Cape Lookout. Fishermen are beginning to report larger speckled trout again. There are still many shorts or minimal keepers, but some two to three pounders are beginning to mix in pretty well. There are speckled trout along the coast and up many coastal rivers. These areas offer sheltered alternatives when the wind is blowing. There are also lots of specks at the Cape Lookout Jetty when the weather allows getting there. Surf fishermen shouldn't forget the stop nets along Bogue Banks if any are still in the water. They are great places to catch a few specks from the surf. In spite of the conditions, pier fishermen enjoyed a pretty good catch this week. 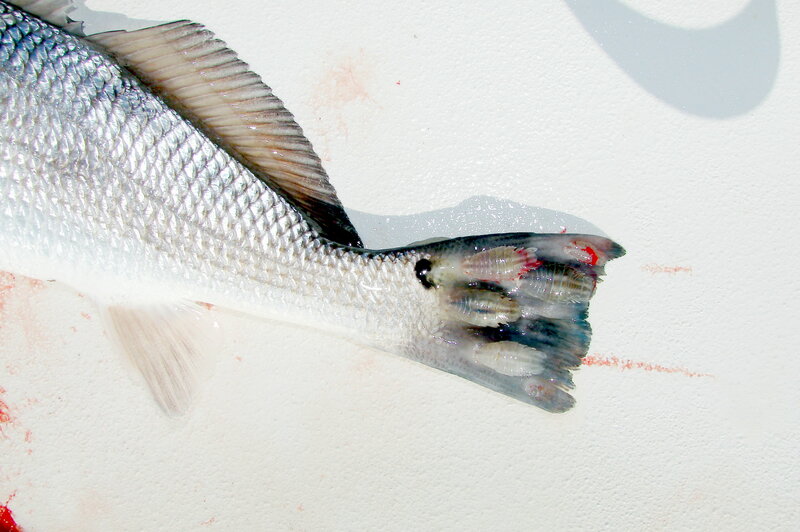 The pier catch included several good runs of sea mullet, some black drum, bluefish, blowfish and a few small specks. This weekend is the last run for most of the piers along the N.C. Coast. Several have already closed and a few may last another week or so. It would be wise to call ahead if you want to go pier fishing. I received an e-mail from a member of the Cape Fear Flyfishing Club about a trip they made to Cape Lookout last week to chase false albacore. The message said they had a great time and caught lots of fish. The message also said it was rather rough one day, but the fish were biting so they put up with it. That seems like a lot of days lately. There were more good reports of false albacore this week. The schools remain scattered from around AR 315, down Shackleford Banks to Cape Lookout. I didn't hear of any inside the hook this week. The hot ticket for the Alberts continues to be small flashy lures and flies that can be retrieved quickly. When the weather allows the trip, the king mackerel have been biting well. There were more big kings caught in Raleigh Bay this week, but none compared to the monster king caught by an N.C. fishing team at the Southern Kingfish Association Championship in Mississippi. See the report below in the tournament results. There are also some kings along most of the coast in 60 to 80 feet of water, but they are not as large as the kings in Raleigh Bay. The spots closer to Cape Lookout mentioned most often include 1700 Rock, East Rock, the Atlas Tanker and Chicken Rock. The spots closer to Cape Hatteras include the Bad Bottoms, AR 220, AR 225, AR 230 and the Smell Wreck. Live bait is a big help in catching the larger kings. Just as a few yellowfin tuna that have been off the Outer Banks begin showing farter south, the weather goes on a rampage. Hopefully they will be there, or maybe even a little closer, when the weather settles. The last report of them came from the edge of the Gulf Stream at the 900 line (Loran Coordinate 39900). This is well north of the Big Rock. There were also some wahoo, blackfin tuna and even a few dolphin being caught. I fished down near the N.C./S.C. state line behind Sunset Beach one of the few sunny days last week with Captains Mark Dickson and Mark Stacy of Shallow Minded Inshore Charters (www.fishmyrtlebeach.com). They fish the water from Myrtle Beach to the Shallotte River and we were targeting puppy drum in the waters behind Sunset Beach and Bird Island. It was a nice afternoon and we varied our fishing from casting under docks to poling into the shallow marsh and casting to fish we could see moving and feeding. Several times we saw red drum in water so shallow some of their backs were sticking out of the water. The fish were biting too. We caught more than a dozen that ranged in size from about 15 to 30 inches. However one of the smaller fish caught our attention. It had numerous parasites attached to its tail (see attached photo). None of us had ever seen this before, so I took some pictures and sent them to Lee Paramore at the N.C. Division of Marine Fisheries (DMF) and to Dr. Fred Scharf at the UNCW Biology/Marine Biology Department. Paramore is the team leader of the DMF Red Drum team and Scharf is a member of several fisheries committees and actively involved in N.C. fishery issues. They both said they had never seen this before either. Scharf surmised that the drum had somehow injured its tail so that it was oozing and the parasites were attracted to that. He said it was a similar parasite to the one often seen in the mouths and attached to the gills of menhaden. For those who understand the biological terms, he said it was an isopod, probably Lironeca ovalis. One way the drum could have injured its tail was with a narrow escape from a porpoise. This was considered highly possible by the fishermen and scientists. For those who are not aware, porpoises and bottlenose dolphins are primary predators of puppy drum, especially during the cooler months when other fish are not available. They will often herd a school of drum into the surf and use the beach to trap them. They have also been seen herding drum in marinas in the southern part of the state. I know it sounds harsh, but Flipper has to eat too! Tournaments are quickly winding down for the year. There is one remaining for this weekend and a pair that are ongoing and will end later. The Chasin' Tails Speckled Trout Tournament began October 1 and will run through January 31. This tournament features overall winners and monthly prizes for specific weight fish. The current leader is Tom Holland's 7.13 pound speck. The special weight for November is 3.25 pounds and it has not yet been matched. For more information, visit www.chasintailsoutdoors.com. The Southern Kingfish Association (SKA) held their 2009 Championship tournament in Biloxi, Miss. last weekend and it had a decidedly Tar Heel flavor. Capt. Brant McMullan, his dad Rube and brother Barrett were there to represent the Ocean Isle Fishing Center Fishing Team and shocked the king mackerel world. It wasn't that they won the tournament; they are good fishermen and always expected to be a contender. The wow came from them laying a 74.10 pound king on the scales the first afternoon. Yeah, I said 74.10 pounds. Wow! This is an aggregate weight tournament and the McMullans added a 44.03 pound king that looked insignificant beside the other one to post an aggregate of 118.13 pounds. This was good for several records. The big king is a pending Mississippi state record and it and the aggregate are new SKA records. It may also be the largest king ever caught in any tournament. Congratulations to the McMullans on catching one of the largest king mackerel in the sea and for winning the tournament! NOTE: This king mackerel, which the McMullans and many other fishermen have nicknamed Fishzilla, will be on display at the Ocean Isle Fishing Center in Ocean Isle Beach this weekend. This SKA has a special class for smaller boats named the 23 and under Class. That championship was also won by a Tar Heel crew. Capt. Rick Croson, Russell Weaver and Jody Gay caught kings that weighed 46.75 and 44.54 pounds to post a 91.29 pound aggregate for Team Blue Water Candy. This group of fishermen is based at Hampstead. Other Carolina fishermen were scattered through the top 10. Congratulations to all. Capt. Kyle's Inshore Classic Speckled Trout Tournament will be held this weekend at the Ocean Isle Fishing Center in Ocean Isle Beach. This is an aggregate weight tournament with TWTs for aggregate weight and single largest fish. Registration will be Friday afternoon and evening, with fishing on Saturday. For more information visit www.oifc.com.